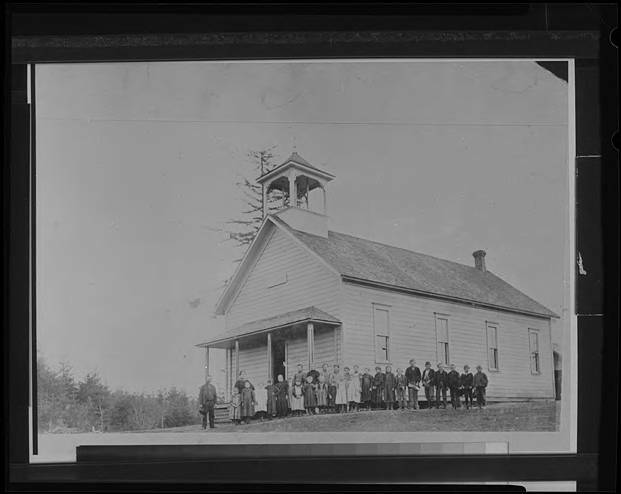 Black and white image of a group of children gathered outside a one-room schoolhouse. The wooden building features a high, gabled roof and a square bell tower on the front apex. The children are grouped according to gender, and the girls wear skirts and pinafores while the boys mostly wear jackets and pants. One boy appears to wear a 'Little Lord Fauntleroy' outfit with a large lace collar and knee-length pants. Helvetia was predominantly settled by German-speaking Swiss immigrants in the 1870s.